This was Samuel Fuller's directorial debut...he would later to the even more stylistic "Forty Guns". This film was shot in a mere 10 days for a low budget of $100,000 (small in even those days). The movie, as you might guess from the title, was not reallyl about Jesse James (played by Reed Hadley) but more about "the dirty little coward that shot Mr. Howard", Bob Ford (John Ireland) who, according to this film, shot Jesse in the back to get a promised amnesty for whoever turned Jesse in. The film featured some unusual close-ups but the film did not have the unusual phtotography that I disliked in Forty Guns and I found this an interesting early effort for Fuller. I found it an interesting low-budget western effort and worth the time it took to watch it. I'm not sure, but I think O Brother, Where Art Thou? may have been the first film by the Coen Brothers that I saw in an actual theater...yeah, I can't believe I missed Fargo on the big screen, either. This was a good first Coen film for me to see in a theater, though, because I thought it was quite hilarious at the time. I'm not sure I find it quite as funny now, but it's still entertaining. During their adventures, the chain-gang trio become popular singers so music (of a bluegrass style) is an important part of the picture, though I think you can still enjoy the movie without being a bluegrass fan. I like bluegrass so that may have helped my enjoyment but I think most people will enjoy this film...it's just too wacky not to get at least a little bit of a kick out of it. I also like the cast, especially George Clooney and Holly Hunter (who I never get tired of seeing). Extras on the DVD include the theatrical trailer, music video for "I Am A Man of Constant Sorrow", behind-the-scenes featurette and a look at the film's unique look titled "Painting With Pixels". ... and Holly Hunter (who I never get tired of seeing). Now why didn't Jon come up with that argument when he recommended the movie to me? May have to give it a try now. Ha! Because I always hope you're above such base and shallow instincts, Matthias, and that you would watch a Coen brothers movie for their unique, subtle and brilliant humour, not for the leading totty. She's in Raising Arizona too. Nice reviews of Coen stuff, Roger. The above comments were in relation to Matthias' review of The Big Lebowski which generated a short discussion about their themes. By the way, I also enjoyed your review of I Shot Jesse James. Must admit I hadn't heard of it. Have you seen The Assassination of Jesse James by the Coward Robert Ford? Beautiful film. Would be interesting to compare the two. I stand to my shallowness, especially when it come to the Coens, because I'm a bit indifferent towards them. As you said yourself, they make such vastly different movies that it is hard to judge if I would like a particular one based on the few I have seen. So the en passant mentioning of Holly Hunter can be all that's needed to persuade me. To be fair, it may not have worked at the time you wrote your comments, but I recently watched the first season of Saving Grace, so I'm currently more open to check out other stuff with her that I haven't seen yet. Jon, I have not yet seen the newer Jesse James film but my brother has the DVD of that film so perhaps I'll borrow it from him. Too bad I've already done my "A" film for November but I can always put it in my ongoing western marathon. I got 3 reviews out today but I still fear I won't be able to finish the A-Z marathon by the end of November. I'll try to get in another 3 reviews during Sunday, though, and we'll see how that goes. If I fear I can't make it, I guess I could do the last batch of reviews of TV series episodes...but we'll see how it goes. This film was shot in a mere 10 days for a low budget of $100,000 (small in even those days). Gunfighter John Bernard Books comes to Carson City, Nevada in 1901 to see a doctor. It turns out he has cancer and has a short time to live. How he deals with it, and those around him and their reactions to him, form the crux of this story. This was, of course, the final film for John Wayne in a long career that spanned nearly 50 years during which time he appeared in over 150 films. Ironically, his character in this film was dying of cancer and that was how John Wayne himself died only a few years after this film was released. Unlike many of Duke's films, this was not really a typical western shoot-em-up, but a character study and not exactly fast-moving...but it is a fine film nonetheless. 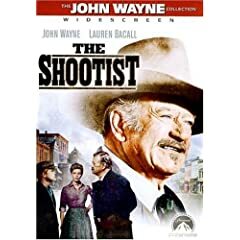 It does have some fine action in it in spots, including an exciting final shootout in a fancy saloon towards the end of the picture (for you trivia buffs, Hugh O'Brian is the final character to be shot by John Wayne on film). A first-rate cast, excellent direction and photography and a fine Elmer Bernstein score all contribute to make John Wayne's last film a first-rate entertainment. DVD extras include the original theatrical trailer and a fine behind-the-scenes featurette including interviews with the producers and with screenwriter Miles Hood Swarthout (son of novelist Glendon Swarthout whose book was the basis for this film). I believe Hugh O'Brian was the one cast member included in the interviews. Fantastic film. Moving and a perfect swansong. Indulge yourself with the definitive version of one of the greatest films of all time. This multi award-winning homage to the love of cinema tells the story of Salvatore, now a successful film director, returning home for the funeral of Alfredo, his old friend who was projectionist at the local cinema throughout his childhood. Soon memories of his first love affair with the beautiful Elena and all the highs and lows that shaped his life come flooding back, as Salvatore reconnects with the community he left 30 years earlier. 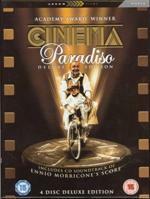 Cinema Paradiso is one of the most beautiful films ever made, both in spirit and photography. It’s an unashamedly nostalgic story about friendship and life, much of it told in flashback as Salvatore remembers the remote town he left behind, especially his old friend Alfredo and the cinema, which is in the centre of the town. The story is like a love letter to film and the best moments happen in the cinema (especially when the town has gathered for a performance!) or because of it. We first see Salvatore, or Toto as he was known, as a young, cheeky boy, running circles around Alfredo, who is the projectionist. He grows into a young man, with the films as a backdrop. The town has a wonderful cast of characters and it’s one of those rare stories you wish wouldn’t end. The photography is gorgeous throughout and director Giuseppe Tornatore has a great eye for simple, but powerful compositions, with fluid editing that sometimes leans toward fantasy (the transition between young and teenage Toto; the sequence in the rain). It sets the mood though because a story about the magic of cinema should have more than its fair share. It’s rather poetic too to have the best cinema composer in Ennio Morricone doing the score. In regards to the cast, this isn’t a film about performances and there is no reason to pick anyone out in particular because they all seem inspired by the material, Phillipe Noiret as Alfredo particularly. There are many sublime moments in this uplifting and gently comic story and it’s difficult to pick one from another, but the funny early sequence of the local priest reviewing films and having every kiss removed, is built up to hilarious effect when the audience watch in hope that finally they’ll see one that got through! It can be sad and moving as well and somehow, the very final moments encompass the whole thing. Simple and effective in the best way. If I’ve made it sound a bit too sentimental, well be assured it has a vein of realism that always keeps it grounded, unlike Italian films that tried to capitalise on its success, like the silly Life Is Beautiful. Take the cinema away and you would have a rather typical story about a young man, scorned by his first love, dreaming of escaping the dusty town he is trapped in. But cleverly, he is willingly trapped by the cinema, so it stays magical throughout, with Alfredo as a concerned voice of reason telling Toto he must leave and must not let himself be blinkered. Indeed the framing device is that Salvatore hasn’t been back to the town for 30 years. His reason for staying away is expanded in the Director’s Cut and we have a fascinating situation here. I’m so glad both versions are included in the DVD set (plus Morricone’s soundtrack CD). The theatrical cut is fairly passive and if you enjoyed The Shawshank Redemption or Amelie, you should love it. The DC adds a thread to Salvatore’s return to the town in which he learns a harsh retrospective lesson that proves what we want is not always best for us. It’s heartachingly sad though and makes you think a lot more. Some feel it bloats the film, but this is only because they’re not used to seeing so much extra in the final chapter. It works very well and adds a challenging perspective. New viewers should watch the theatrical cut and then the DC when they inevitably return to this wonderful film. I’ve often spoken of the magic of cinema and if you feel the same way as me, you will adore this story. If you don’t feel the same way by the end, check you still have a pulse! 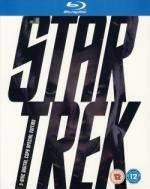 "STAR TREK is a burst of pure filmmaking exhilaration and an irresistible invitation for fun." The cocky, renegade James Kirk (Chris Pine) and the equally youthful half-Vulcan, half-human Spock (Zachary Quinto) are among the young members of a fledging Starfleet crew, and about to launch the most advanced starship ever created: the U.S.S. Enterprise. During their incredible galactic voyage of exploration and discovery, they will encounter the evil Nero (Eric Bana) whose mission of vengeance threatens all of mankind. With both the blockbuster-hit film and all-new special features on this two-disc Digital Copy Special Edition, you will journey behind the scenes and immerse yourself in a thrilling, action-packed Star Trek universe, as you have never experienced before! When I first heard about the idea of making a Star Trek prequel movie years ago (the talk was about a Star Trek Academy movie), I was shocked that they even considered something like this. I wanted further TNG movies or DS9 movies. But after the failure of Nemesis and the new Enterprise series, I didn't want any further movies. When then again came up the topic of a Star Trek reboot movies years later, I was all for it. Now was the right time for it. Even though I was all for it, I was going into it was some trepidation. The trailer hadn't really convinced me yet. But I was positively surprised by the movie. They managed to make a reboot with the possibility to explore new directions, but they didn't ignore the past movies. Having Leonard Nimoy as the old Spock from the previous timeline's past in it to bridge the gap was the only move which probably could pull that off. The new cast is perfect. The new Spock is a dead-on young Leonard Nimoy. The new Kirk has the spirit of Shatner's Kirk, but they thankfully chose to not imitade Shatner's delivery style. That would have come across as a Shatner parody instead of a new incarnation of Kirk. Simon Pegg as Scotty was alright as was the other supporting Enterprise crew. The new Bones is the one who surprised me the most. When I first saw him, I did not think that he was right for the role. He didn't look anything like DeForest Kelley. But his McCoy was dead-on. - I didn't like the "Star Wars" sequence on the Ice Planet, where Kirk is chased by a monster which in turn is caught by an even bigger monster. Also it is just too much of an coincidence, that Kirk is jettisoned to only a short walk away from where the old Spock is marooned. - I didn't like it, that the kid Kirk is driving a vintage automobile. This scene is what bothered me most in the trailer. And the Nokia phone was the most grinchworthy moment in the entire movie. - I didn't like it, that again the Romulans where the villains (like in Nemesis), but at least it was understandable, because we knew from TNG that the old Spock was involved with Romulans the past few years. - Overuse of lens flare in the bridge scenes. Is the bridge supposed to be a light show, or what? Also there are some moments, which bother me a little, but they do count as character flaws and not movie flaws: Like why did they give the charge to the redshirt guy and do not have one themselves? They didn't know who will survive the fall, so they should have planned to have backups. And am I understanding it correctly, that because of the stupidity of the redshirt, Vulcan was doomed? - Kobayashi Maru: We learn in Star Trek 2 that Kirk is the only one ever beating the test scenario. Shatner was also eating an apple telling about it, like Chris Pine did while taking the test. - The "friends" speech by Spock. First spoken in Star Trek 2. - Spock also chose to not complete the Kolinahr in Star Trek 1. - Spocks parents where first seen in the TOS episode "Journey to Babel", but were also part of Star Trek 4. His father was also in 6. - I also got a kick out of Leonard Nimoy declaring "I am Spock" in the movie. Which is the title of his autobiography. - Old Spock giving Scotty the formula which Scotty would have invented later himself is reminiscent of a scene in Star Trek 4. - Nero is using the same creatures to extract information from Pike as Khan did in Star Trek 2. Would have been fun though, if we would have gotten an updated "ear-invasion" scene, instead of putting it in the mouth. - Sulus experiance in hand-to-hand combat is of course a reference to a scene in a TOS episode, where we see Sulu fencing. I agree. It couldn't have been a better character for the Duke to portray in his last film.